It is difficult to convey the immensity and emptiness of the Republic of Kiribati. The country extends across more than 3.5 million square kilometers (1,351,000 sq mi) of oceanic space, an area considerably larger than India. The distance between its western and eastern islands is comparable to the distance across the United States. Yet Kiribati contains only 800 square kilometers (310 sq mi) of land, an area slightly larger than the city-state of Singapore, and considerably smaller than the city of Los Angeles. 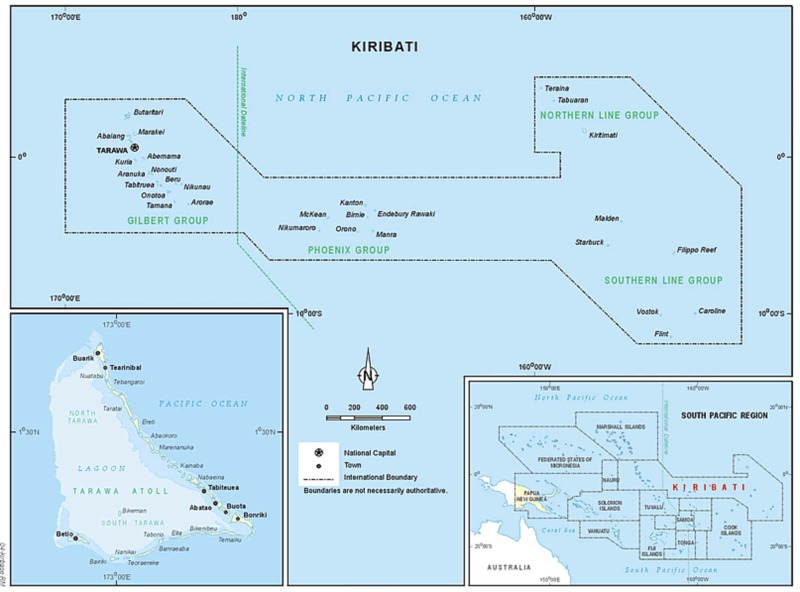 With some 103,000 inhabitants (in 2010), Kiribati has only a moderately dense population. 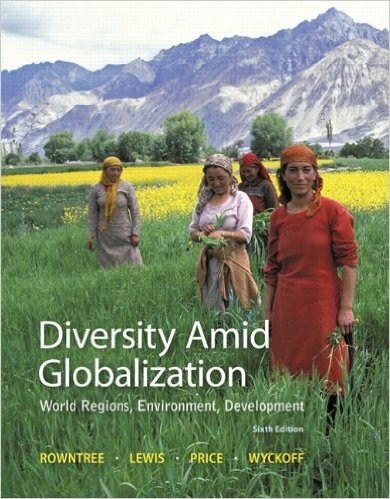 Its 135 people per square kilometer of land (350 per sq mi) places it in the 73rd position among the world’s 244 sovereign states and dependent territories, well below Italy, Germany, and the United Kingdom. 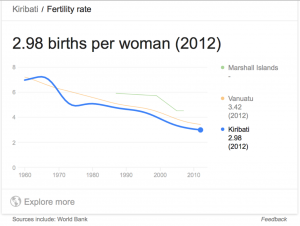 But such figures are misleading, as the population of Kiribati is by no means evenly distributed over its far-flung expanse. Most of its residents live on the 16 atolls of the Gilbert Archipelago in the west. Here more than 85,000 people are crowded into roughly 281 square kilometers of low-lying land. On the main atoll of Tarawa, a fast-growing population of some 55,000 is limited to 31 square kilometers. 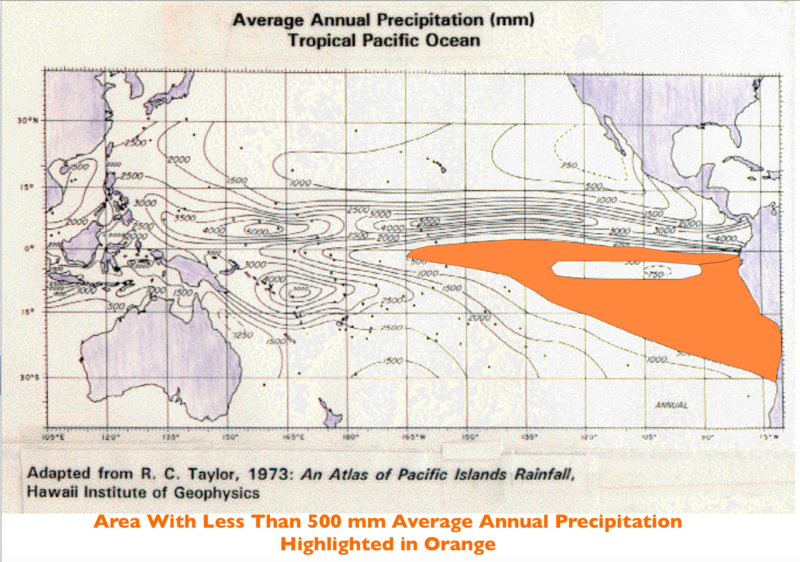 Tarawa’s highest point is three meters above sea level. The Phoenix Islands in central Kiribati are a different matter. These islands contain 84.5 square kilometers of land but their population is negligible. Only Kanton Island is inhabited, and its population in 2010 was all of 24, having declined from 61 in 2000. Although archeological remains indicate that some of the Phoenix Islands had once been settled, they had no human inhabitants when they were first sighted by Europeans. In the late 1930s, major efforts were made to populate the Phoenix Islands, described by the Wikipedia as “the last attempt at human colonisation within the British Empire.” Imperial agents wanted to reduce over-population in the southern Gilbert Islands and to forestall potential U.S. attempts to gain territory under the Guano Islands Act. The colonization project was abandoned in 1963, however, with the settlers returning to the Gilbert Islands. Low prices for copra, the islands’ only significant export, along with recurrent drought, undermined the scheme. Drought is also a problem in many of the Line Islands, which form Kiribati’s eastern archipelago. The central and southern Line Islands fall within the low-rainfall region of the eastern Pacific, which is generated in large part by the cold waters of the Humboldt Current that are deflected into the equatorial region by the shape of the South American landmass. 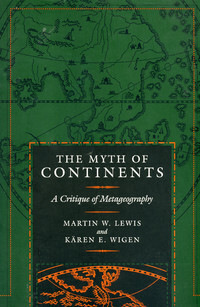 Partly as a result of meager and uncertain precipitation, the Line Islands—which themselves stretch over 2,350 kilometers of sea-space—were also uninhabited at the time of European discovery. 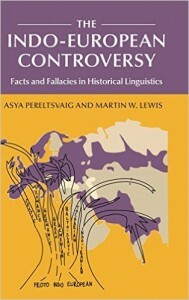 They were all claimed by the United States under the Guano Islands Act, but the U.S. relinquished all of its claims in 1983, with the Congressional ratification of the Treaty of Tarawa (more formally known as the “Kiribati, Treaty of Friendship and Territorial Sovereignty, September 20, 1979,” with a subtitle reading “Treaty of Friendship Between the United States of America and the Republic of Kiribati”). The population of Teeraina in the 2010 census was 1,690. Compared to the 2005 population of 1,155 and the 2000 population of 1,087, the population is growing very rapidly. 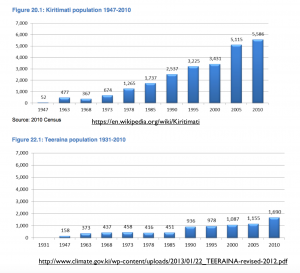 The population of Teeraina grew by 535 people between 2005 and 2010, an annual population growth of 7.9%. 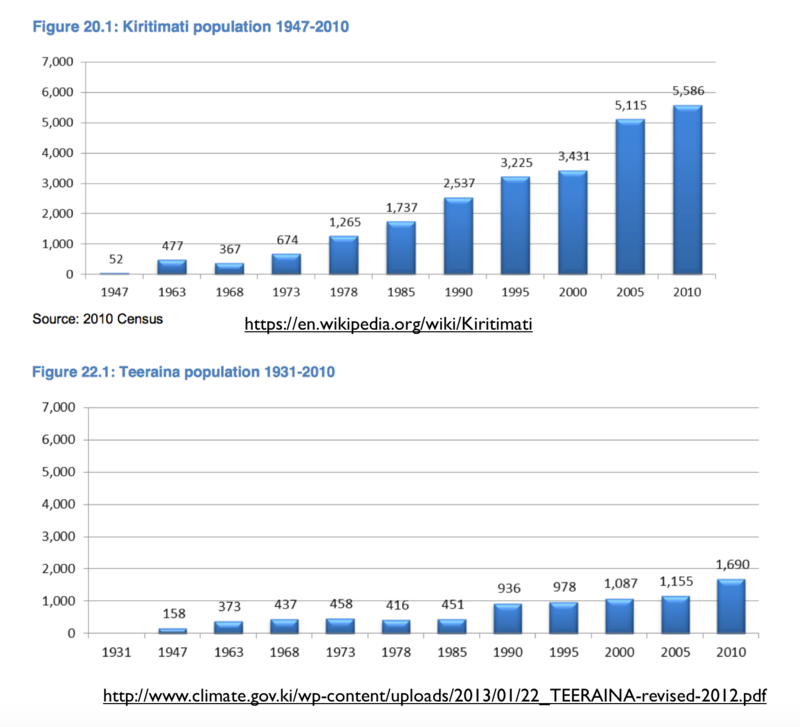 In percentage terms, Teeraina is the fastest growing island in Kiribati, although the growth is much less significant in terms of absolute numbers. 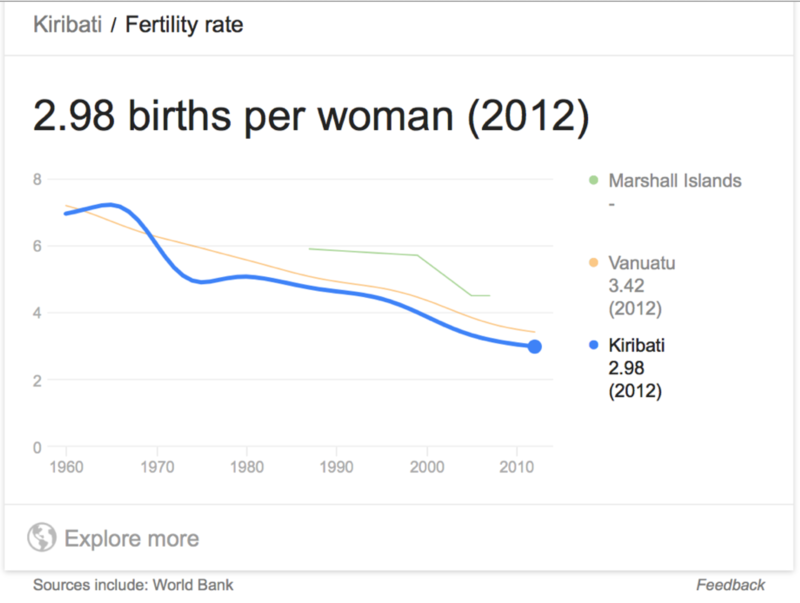 Growth on Kiritimati Island, the giant of not only the Line Islands but also of Kiribati as a whole, has been even more dramatic, its population jumping from 3,431 in 2000 to 5,115 in 2005. 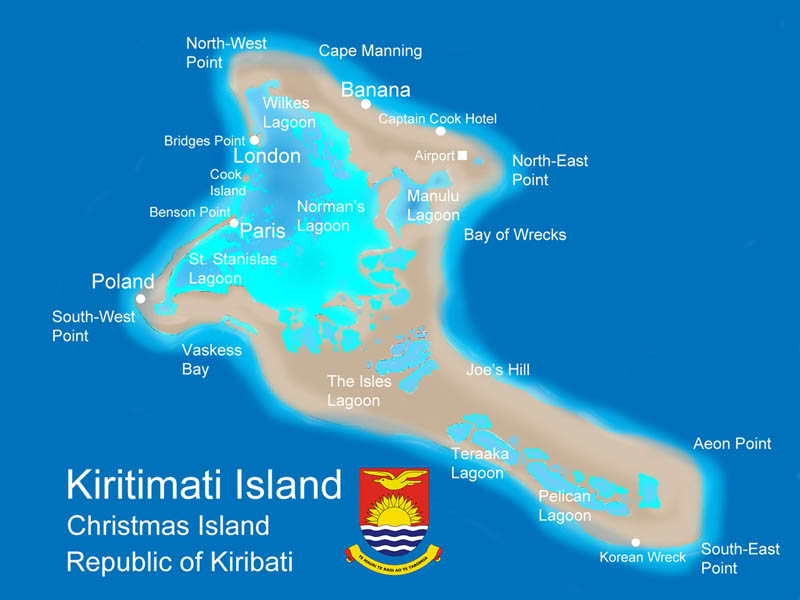 With some 388 square kilometers of dry land, Kiritimati Island has a larger terrestrial extent than any other coral atoll in the world. 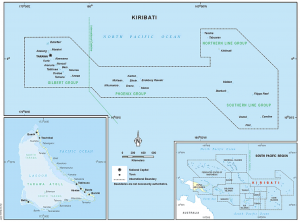 The vast majority of the people now living in the Line Islands are originally from the Gilbert Archipelago and speak Gilbertese, also known as the Kiribati Language. * As noted in the Wikipedia, “Unlike many in the Pacific region, the Kiribati language is far from extinct, and most speakers use it daily. 97% of those living in Kiribati are able to read in Kiribati, and 80% are able to read English.” Gilbertese has also expanded into nearby countries, with some 5,000 people speaking the language in the Solomon Islands and perhaps another 1,000 doing so in Vanuatu. The European Union has just announced a 23 million Euro grant for Kiribati, money that will be used to develop the nation’s largest atoll, Kiritimati Island. Although it makes up 70 per cent of the country’s landmass, Kiritimati Island was virtually uninhabited for decades and is relatively undeveloped. By improving facilities on the island, the EU Ambassador to the Pacific Andrew Jacobs says the aim is to reduce the threat posed by climate change to the main population centre of Tarawa. 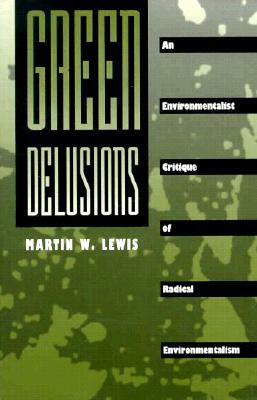 Population has been growing rapidly since the early 1900s, and overpopulation is a serious concern of the government. While family-planning methods were introduced in 1968 and are delivered free, fertility remains moderately high and large families are culturally valued. Despite government efforts to maintain and improve life on the outer islands, there has been substantial migration to the capital on South Tarawa. There are several thousand I-Kiribati in other countries, most serving as temporary workers.